Born in Leicester on 9 April 1938. Educated at Mill Hill School Leicester. Articled at John Rowley & Co Chartered Accountants 1954 – 1960. Qualified as a Chartered Accountant in 1960. On 1 March 1963 joined T J Brooks Ltd a subsidiary of GKN Ltd as Chief Accountant. Appointed Financial Director in 1965. In 1979 the Company was acquired by SPS Technologies Inc of the USA. Appointed Managing Director in 1982. In 1994 became Chairman of SPS Technologies Ltd UK Operations which included a number of subsidiaries manufacturing Aerospace and Automotive companies, magnetic and specialised tooling. Retired from SPS in 2000 and subsequently became Non-Executive Chairman of Paul Fabrications (2000 – 2007) and Blagg & Johnson. 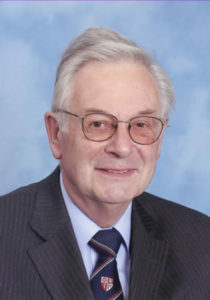 President of the East Midlands Engineering Employers Association 1992 – 1994. Member of the Engineering Employers Federation 1988 – 2008. Council Member, Deputy Chairman of Finance Committee and Chairman of Pension Trustees. Awarded OBE in January 2000 for services to the Engineering industry. A keen sportsman – played rugby, cricket, tennis, badminton, squash and golf. Member of Leicester Host Lions and Britain-Australia Society.